Lillian F. Sierk was born on 1 October 1896 in New York. Henry Sierk Jr. and Cora Almeda Lindsey appeared in the US federal census of 1 June 1900 in Attica, Wyoming County, New York. Other members of the household included Lillian F. Sierk, Ray Grant Sierk, Glen Henry Sierk, Mary Ethel Sierk and Leo Carmi Sierk. Also in the household was nephew Leon Vanvalkenburg, age 16, working on the farm. Henry Sierk Jr. and Cora Almeda Lindsey appeared in the US federal census of 15 April 1910 in Attica, New York. Other members of the household included Lillian F. Sierk, Ray Grant Sierk, Glen Henry Sierk, Mary Ethel Sierk, Leo Carmi Sierk and Carmi Van Rensselaer Lindsey. 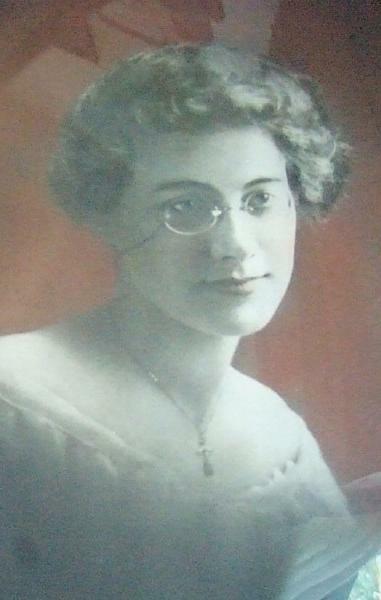 She witnessed the marriage of Mary Ethel Sierk and Gaylord Stephen Guenther on 19 October 1916 in Attica, New York; with Emmett M. Kelly officiating. Henry Sierk Jr. appeared in the US federal census of 1 January 1920 in Attica Township, Wyoming County, New York. Other members of the household included Lillian F. Sierk, Glen Henry Sierk, Thelma M. Seligman and Claus Sierk. She married Harold F. Ames, son of Ebenezer Ames and Emma A. (? ), circa 1924. Gaylord Stephen Guenther and Mary Ethel Sierk appeared in the New York state census of 1 June 1925 in Niagara Falls, Niagara County, New York, at 1887 Cleveland Avenue. Other members of the household included Lillian F. Sierk, Marilyn Ethel Guenther. She was employed as a store clerk, according to the 1925 census. Harold F. Ames and Lillian F. Sierk appeared in the US federal census of 1 April 1930 in Attica, Wyoming County, New York, at Creek Road. Other members of the household included Beverly J. Ames and Henry Sierk Jr. The SSDI lists Hamburg, Erie County, New York, as the last residence of record of Lillian F. Sierk. Lillian F. Sierk died on 10 November 1988 at age 92.